The Brome 1024 Squirrel Buster Plus Wild Bird Feeder with Cardinal Perch Ring is by far one of the most exciting bird feeder in the market. During the course of our conversation we are going to take a look at some of the pros and cons associated with the bird feeder but before we do that you should check with your local authorities to make sure it is legal to feed birds where you are living just to be safe. 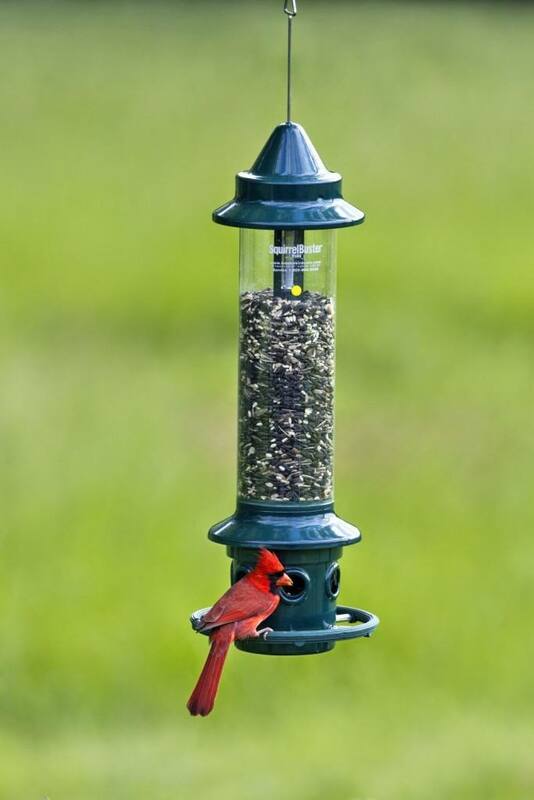 The squirrel proof bird feeder is specifically designed to attract Cardinals so if you love Cardinals then this bird feeder should be placed on the top of your list. While there is a plethora of bird feeders available out there this one has patented technology that prevents squirrels from stealing the seeds from your birds. This squirrel proof bird feeder technology is quite ingenious the way it works, when a squirrel steps on the bird feeder there is a door that closes restricting access to the seeds but the moment the squirrel gets off the feeder the birds can eat again. The mechanism for keeping squirrels out has helped the Brome 1024 win the prestigious Birdwatch America Best New Product Award. Aside from having a mechanism to stop seeds from flowing out the moment a squirrel climbs onto the feeder however that is not the only security feature. Another feature is the “chew proof” materials being used in the squirrel proof bird feeder, even if the squirrel tried it could not gain access by gnawing on the feeder. Since the feeder can hold up to three (3) quarts of seeds you should not have to refill it often, most individuals only feed it once a week however it depends on the number of cardinals in your area and how often they come to eat. You will have the ability to hang the feeder just about any place you want to, since the feeder is self-contained and virtually squirrel proof you do not have to worry about losing your seeds. When you do refill the feeder you can take it down and place it inside the dishwasher for a comprehensive cleaning. Since the unit is dishwasher safe you can clean it so birds keep coming back to eat often. There are a few drawbacks associated with the squirrel proof bird feeder but they are negligible. The first is that since the feeder is intended primarily for Cardinals if you like smaller birds then this feeder would not be a good choice. This feeder is designed for birds with large feet and long necks to reach inside and grab seeds so a smaller bird would have a very difficult time accessing seeds if you do not adjust the weight settings. As we mentioned earlier this unit comes with a specially designed system that will detect the weight of a squirrel and lock up the moment this weight limit is reached. Since smaller birds tend to eat together if you do not adjust the weight on the feeder then when a large number of birds congregate on the feeder it will trip the anti-squirrel device preventing all of the smaller birds from eating. 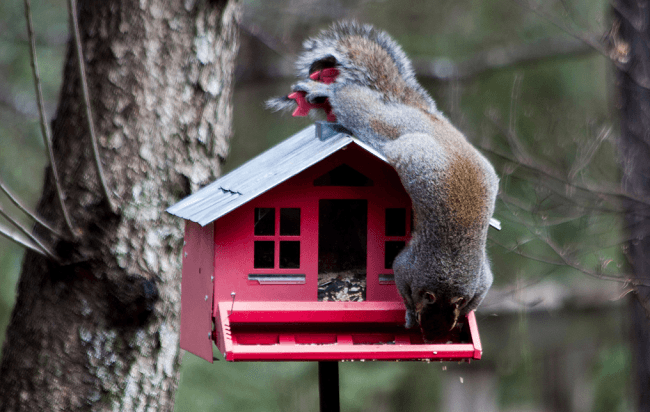 Another potential drawback is the cost of the squirrel proof bird feeder, depending on your budget this could be slightly more than what you are willing to pay for a bird feeder. The primary reason people purchase this unit aside from their love of Cardinals and other larger birds is to help them combat the squirrel population. Also since this is a high capacity bird feeder it will cost a fair amount of money to keep it filled throughout the year so unless you have a robust budget this may not be the right bird feeder for your property. In the spirit of providing an unbiased review we are going to take a sample from both those who love and do not love the Squirrel Buster Plus. The majority (84%) of the people who left reviews gave it a 5 star which is pretty commendable given the cost of the unit. One of the things that were highlighted as how the bird feeder ventilated the seeds to keep them fresh which is not standard in most comparable bird feeders. When the seeds do not receive ventilation they could turn bad or become lodged preventing seeds from reaching the birds. The only complaints that came up had to do with customers not following the directions on how to properly install the bird feeder but in all fairness that is the fault of the consumer and not the manufacturer. Aside from that feedback the only other complaint was due to the pricing which we covered earlier but to be fair the feeder does come with a variety of features that help provide the birds with a more pleasant eating experience. Since the feeder is chew resistant the consumer will not have to spend money purchasing a replacement every couple of years so in the long run the consumer will actually save money by investing in the higher quality Brome 1024. Customers have also reported back that the customer service provided by the people who work at Brome is top notch which is not a tangible but goes a long way to show just how committed the company is to customer satisfaction. There is nothing more frustrating than spending a large sum of cash on a bird feeder and when you need customer support there is nothing available to you. If you or someone you know loves birds, then this would make a great gift for them just make sure you get lots of seeds for them so they can fill the feeder up when they receive it.